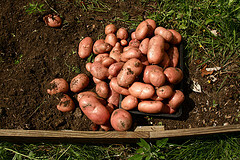 This Saturday’s workday is potato planting day! We have 3 main crop varieties to plant, that’s 75 kg of seed potatoes! At the last workday twenty-eight of us had great fun planting 400 hedging plants (blackthorn, hazel, crab apple and dog rose) as well as planting a willow coppice. Planting starts at 10 am. Bring a mug and picnic for lunch to finish at 1 pm. If you can, bring a spade.